DevBlog #18 - Space Haven has a home page! And some very cool gifs you want to see. Bugbyte Forums Space Haven Forums Space Haven Gamedev blog DevBlog #18 - Space Haven has a home page! And some very cool gifs you want to see. 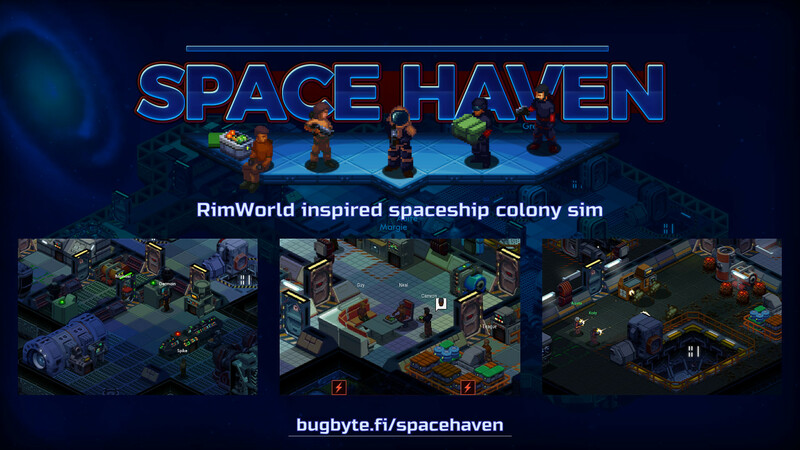 We have spent the past couple of months progressing quite well with Space Haven. We started focusing on game play and right now we're improving the UI to look much better! We have made a lot of progression regarding the AI of characters, they are now acting self-preserving and trying to stay out of trouble as much as possible. This really improved game play a fair bit already! Sorry it is taking so long, but we absolutely have to nail the game play or otherwise all work will be for nothing. There just isn't any room to give out a mediocre game. I know a lot of you must be yearning to know when the game comes out, but I do not have a definite answer yet. I can say that the game is starting to be playable now, we have played it for up to 1 hour already ourselves. It needs more content and more overall improvement though, but we're getting there! I will soon post new screenshots once we get the UI update ready, that will make the game look even better than before. Phyllis, the pilot of a mining pod, arrives to the air lock with resources to unload. Phyllis is going to grab a bite to eat before heading out again. August, the engineer, loads the core module of a newly captured ship and powers up the ship. Lights flicker as power is distributed to different parts of the ship. Ronna goes spacewalking to fetch a mining pod, she then docks it at the spaceship hangar area. Meanwhile, we spent time to set up a dedicated home page for the game, and also social media channels. So definitely check them out and give your favorite channel a follow below! Every update the things looks better!! If I may venture a suggestion for you to consider: Keeping dev blogs on the web page in a... well, blog format? It could link to the posts here of course to use the commenting feature already in the forum. The benefit would be that the ones mainly or firstly interested in the content of the blog post would get a much easier view of it and it would be a lot easier to follow the posts in order (yeah, they are numbered, but they are scrambled so sometimes it's hard to know if there has been a new one. Especially if I haven't checked in for a while). No biggie, of course - I'm very content there are dev blog posts at all! Thank you for the encouraging words guys! And that is a good idea Zahlea, will see if I do something like that! Is there any techical alpha/beta planned for bugfixing, balance, etc? @Darkki. Probably going to have some type of early access at some point! Not sure when and how that will be. (03-17-2018, 07:04 AM)AdmiralGeezer Wrote: @Darkki. Probably going to have some type of early access at some point! Not sure when and how that will be. The game looks really good. It has been over six months since space haven caught my attention and I’m not sure whether I’ve just gotten jaded in my old age, but I just have the impression it is turning out to be a “Czech Dream”. (If anyone is wondering what I’m referring to google it). Don’t want to be the nay sayer if you are actually working on a legitimate product. Then more power to you and best of luck.